amazing-wireless has no other items for sale. Sales tax may apply when shipping to: IA*, MN*, NJ*(6.625%), SD*(6.5%), TX*(8.25%), WA*. V30 is indeed brand new and I'm very happy with it. Fast shipping! Brand new phone as advertized, works great! Thanks! I'm extremely happy with this phone. It checks off the three things on my list: battery life, camera and edge to edge screen. The battery life gets me 3.5 - 4 hours of screen on time. I don't worry about how much I have left. The power saver mode is great too. The camera takes really nice pictures, especially with the ability to fit more things in the frame using the second camera. The software is nice and has good tips, although I wish they could be permanently dismissed. It also has a high quality audio DAC used when listening with headphones. There is only one main speaker at the bottom of the phone though. I would highly recommend this phone. 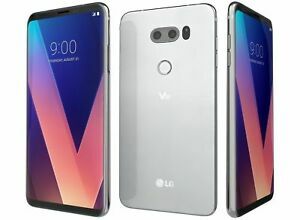 The LG V30 is a fantastic phone for anyone who wants a top knotch performer in every regard, unquestionably the best quality of sound, thanks to the built-in quad DAC. Nearly bezel-less design, which is about as wide as the Note 8 and as wide as the Galaxy S8. There video capturing capabilities are some of the best in any phone out there, however the only possible the quality of photos, at least when it comes to competing with the latest flagships. When compared to photos taken with a Samsung Galaxy S8, they just lack the sharpness and clarity while adding more noise into the background. The images are by no means poor quality, especially if you know what you're doing and are comfortable using the fantastic manual mode, although the inclusion of the very useful wide angle lens does have a lot of added value as I find myself using it quite often. My primary two concerns were to have a beautiful looking screen and powerful sound output, with photography being a close third priority. The LG V30 delivers as well as possible with consumer level technology on the first two, but falters on the third, which for me is an unfortunate but worthwhile trade-off that I'm loving to use more and more with each day. Best smartphone on the market! I've had the V10, V20 and now the V30. Liked So much I bought one for my wife! Across the board in functionality, an really great phone. Without a doubt, sound system and audio recording superior to any phone on the market! Next phone I buy will be the V40.